The Leidenfrost effect, also known as film boiling, occurs when a liquid comes into contact with a solid that is at a temperature well above the liquid’s boiling point. 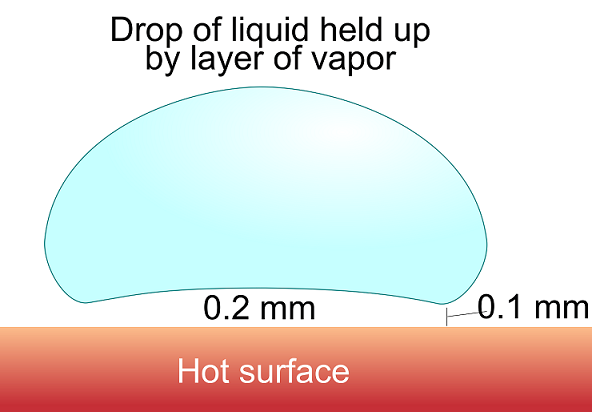 Upon contact, a layer of vapor forms between the liquid-solid interface, creating a barrier between the two. There are many examples of this phenomenon, ranging from something you may have seen in your kitchen (water “dancing” around in a pan) to things you shouldn’t try at home (dipping your hand into a pot of molten lead). Let’s take a look at these different examples of the Leidenfrost effect and delve into how it works. The process of film boiling is attributed to the doctor and theologian Johann Gottlob Leidenfrost (1715-1794) who first described the effect in a manuscript titled A Tract About Some Qualities of Common Water. The most common occurrence of the Leidenfrost effect can be found in the kitchen, when a droplet of water is placed on a hot frying pan. If the pan is heated to the Leidenfrost point, about 200°C, the water evaporates so quickly that a thin layer of vapor forms between the pan and the water droplet, protecting the water from the burning hot pan. The vapor also causes the water droplet to “dance” around in the pan as the vapor propels it in different directions. The droplet will of course evaporate over a certain amount of time, but it will take significantly longer than if the pan were heated to a temperature above boiling, but below the Leidenfrost point. Leidenfrost droplet. Image attribution: Vystrix Nexoth at the English language Wikipedia. While seeing a droplet of water dance around on a pan is an apt example of the Leidenfrost effect, there are other demonstrations available on the web that are a little more edgy and entertaining. These include sticking a hand into a bucket of molten lead or liquid nitrogen, and even sending water droplets through a metal maze. For a more practical application and study of the Leidenfrost effect, check out my previous blog post detailing a hot metal puck being cooled in an oil bath.